Successfully Added Purple Laser Pointer (Black Metal Edition) to your Shopping Cart. Purple laser pointer (black metal edition) that makes the perfect tool for any seminars, presentation or lectures. With an impressive unique purple (violet) colored laser, this is one pointer everyone will notice. If you need to make that perfect presentation and really want to capture the audiences attention, why not do something useful and inspiring by highlighting key points with this impressive presentation gadget? What’s even cooler, is that you can use this for a lot more than just pointing to charts on powerpoint slides. 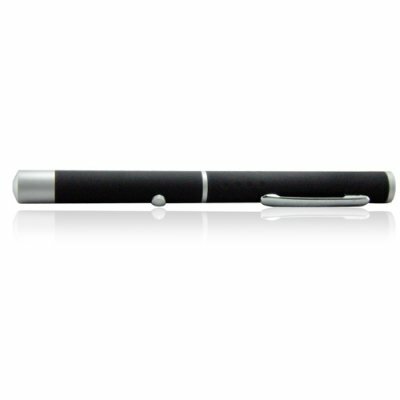 Since this laser pointer comes with an output power of 5mW and is specifically designed to fit in your pocket just like a normal pen, you can carry it with you all the time. It is always ready for action at a simple touch of a button! Built with an all metallic casing, you can feel the durability and high quality from first contact. This model laser pointer is perfect for students, engineers, doctors, teachers and people who all need one to make their work stand out, or simply just want one for fun. This is a more convenient way to simply point at an object, rather than walk over and use your hands, yawn! As the user, you may also notice this interesting effect - the purple may look blue when you point it at any white objects having a blue hue. This is to be expected. 5mW purple laser pointer for the perfect presentation or seminar. Excellent design and built to easily carry anywhere. What is the maximum distance that the laser can reach? The laser is strong enough to reach across any room, and is best to use at night or low light conditions for clear visibility. It's a laser that's pretty much UV, so anything UV reactive will glow with this laser. It's also great for charging up glow-in-the-dark stuff or just making stuff glow. All-around awesome.